Irish Cup holders Glentoran will face a tough opener in this season's competition against Portadown at Shamrock Park on 11 January. The only other all-Premiership tie will see league champions Cliftonville hosting Coleraine. 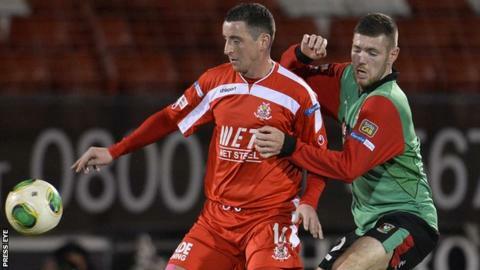 The treble-chasing Reds were beaten by Glentoran in last season's cup decider. Current Premiership leaders Linfield have a home tie against Dergview with second-placed Crusaders facing Belfast junior club Crumlin Star. Of other Premiership sides, Dungannon Swifts face a trip to Moyola Park with Ards hosting Armagh City at Clandeboye Park. Glenavon will be at home to Sport & Leisure with Ballinamallard United taking on Strabane Athletic, Ballymena United travelling to H&W Welders and Warrenpoint Town up against Chimney Corner. Linfield's opposition Dergview are currently 12th in the Championship 1 table while Dungannon will be facing a Moyola Park outfit that are 11th in the Championship 2 table. Ards will be taking on an Armagh City side who are occupying third place in the Championship 2 table - 13 spots higher than Glenavon's opposition Sport & Leisure. Ballinamallard will be hoping to avoid a shock against a Strabane Athletic side who play in the Northern Ireland Intermediate League which is comprised of North West clubs. Crumlin Star, who play in the Premier Division of the Northern Amateur League, were drawn first in their tie against Crusaders but the Crues will have home advantage in the tie. Ballymena United will face a H&W Welders side currently 10th in Championship 1 while Warrenpoint Town will be taking on a Chimney Corner outfit occupying 12th in Championship 2. All ties are scheduled for Saturday, 11 January.